A new featured dish: my favourite noodles ever! Hills BBQ in Box Hill is famous for its roast meats, but if you can tear yourself away from the glorious sight of the shiny lacquered ducks, the crispy roast pork, and the glossy chickens hanging in the window, may I suggest you check out their menu of noodle and rice dishes? 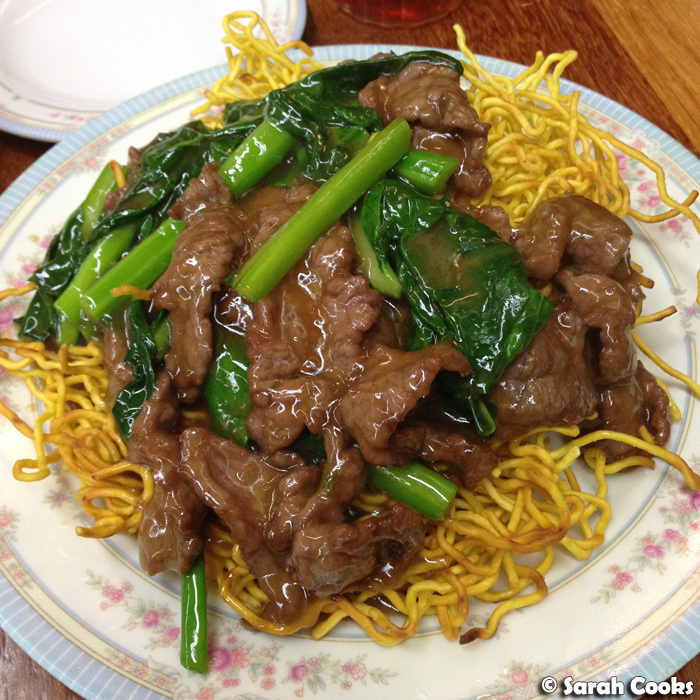 The beef on fried noodles (AKA ngow yok chow minh) is my favourite dish at Hills - well, one of my favourite dishes anywhere! I love them so very much. Only $8.50 for a massive plate, and they always come out steaming hot and deeelicious. The best part of these, for me, are the noodles themselves: the fried egg noodles are crunchy in parts, with those in the middle going delightfully soggy from soaking up the flavoursome sauce. Add crunchy fresh gai laan and a generous amount of beef slices, and you are in flavour country! My family has been ordering this dish for at least the last decade and it's always been great. (Yay for consistency!) My brother, especially, craves it when he's been away for a while. Side note: I had a little fangirl freakout moment when Sami Tamimi replied to my (non-Ottolenghi-related) tweet about these noodles. Woo! (I'm assuming he meant looks "delicious", hehe). 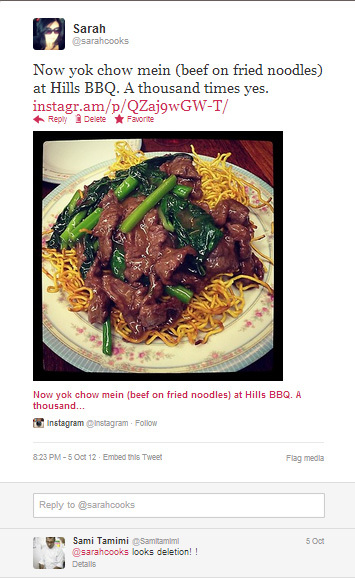 But I half wish you didn't blog about it so we can keep it as a local Asian secret. Haha! I love that place so much. It's so near where I live! Can't wait to read more when you post your Human Brochure posts.